The 2016 Mazda Miata is something that we have been rather excited about for quite a while now. And since the Miata is known as the race car of the people, it was only a matter of time before a new MX-5 Cup Car broke cover. Well, here it is. 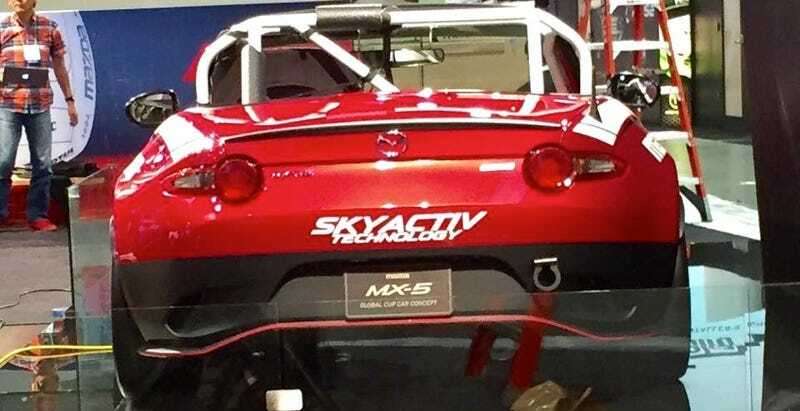 Due to be unveiled at SEMA later today, the 2016 MX-5 Cup Concept was spotted a little early by the guys over at V8 Roadsters on Facebook. What do we have? Slick tires, a full roll cage, a slick paint job, and a fully stripped interior. Yeah, it looks great. We'll have full details when it gets revealed for real later on.